This Kingsport Super Lite travel trailer is the perfect model for a family of four or five just starting out in the world of camping. 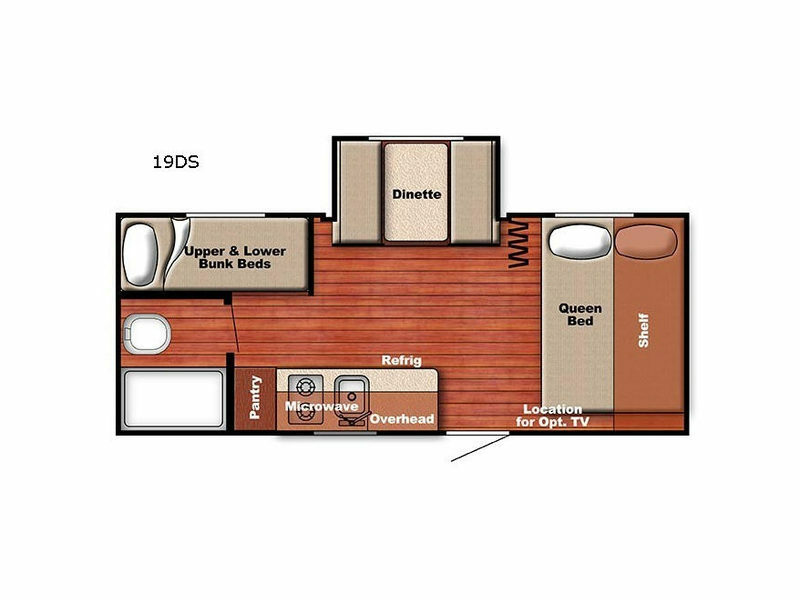 Model 19DS features a single slide for added interior space, a set of bunk beds for the kiddos, and all the amenities you need to begin camping! The booth dinette is the perfect place for you to enjoy your meals at or even convert into an extra sleeping space at night. When you're ready to hit the sack, you can head into the front private bedroom and enjoy a good night's rest! 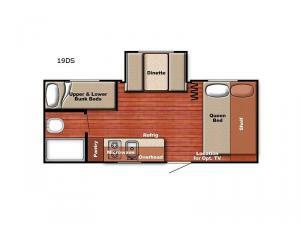 In any Gulf Stream Kingsport Super Lite travel trailers, you will find an affordable way to travel. Each unit is easy to tow and compact. A few construction features include a one-piece seamless roof backed by a 12-year warranty, a 5/8" floor decking, and a powder-coated steel I-beam frame with welded outriggers. Each Kingsport Super Lite is offered in a variety of lengths and floorplan styles with each featuring a functional and quality living space including a complete bath, and galley amenities that make it easy to prepare light meals or snacks as you travel. You are sure to love the interior design with the maple solid wood cabinetry, Hi-performance wood grain vinyl flooring, and the shower skylight. Travel to your next vacation destination towing a Kingsport Super Lite travel trailer by Gulf Stream, and see what makes this super light weight something to talk about!